What does your children’s school do to raise school funds? 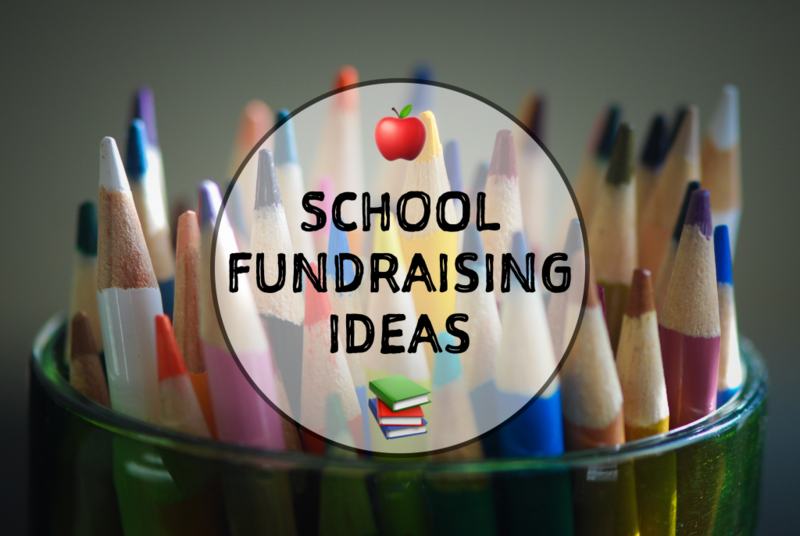 What simple school fundraising ideas prove a big hit and are easily achievable? Need some more ideas? We put the question to our community of parents and they came back with some fantastic ideas to raise money. Collect coppers and each class competes against each other to see who has the longest trail. 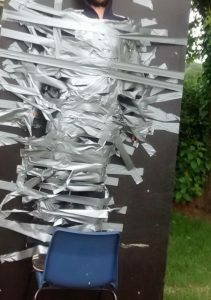 At the School Fair/Fete why not sell strips of duck tape (donated by a parent) to tape a teacher to the wall? You need to sell enough so the teacher doesn’t fall when the chair is pulled out. It’s always was a big hit with the kids! Children arrive at 8 am in PJs, do a sponsored run then go into the hall for cereal and toast. Lots of book/reading-based activities and chips (donated by local chip shop)/plus a hotdog. Tickets are sold for a small fee and teachers or parents give their time to facilitate. An evening of board games or movie watching whilst wearing slippers and/or PJs with a round of hot dogs too! Each class has a large money jar and parents bring in loose change. The class with the most money gets to choose what to spend their total on and the rest of the money collected from the other classes is given to the PTA. 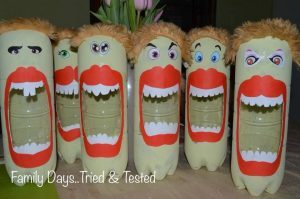 You could make these Monster Men Bottle Banks for your class penny collections. You pay a small price for your bag and then get a special bag with goodies in. For example, a tea bag, brioche bun, mug, orange juice and a little keyring made by the child. Pop up tents, face paints, live music, glow sticks, hair braiding and dancing. A perfect event for a summer’s evening. A masterclass in fruit preparation and chocolate yumminess. Use a chocolate fountain and some skewers. You’ll need Swiss rolls, tin foil covered cardboard to use as trays, chocolate buttercream and decorations. Set up a wall or cupboard to display donated uniform for sales. 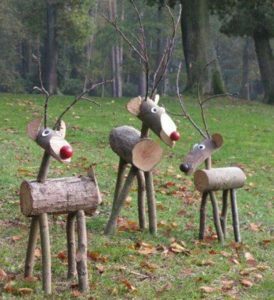 The kids are supplied with logs and sticks to make reindeers as presents or to sell at the School Fair. Give all the children a Smarties tube to take home and do chores to earn 20ps to fill it with. Minimal effort but max £££. This one takes a book more planning as you need to take over the village/neighbourhood for a weekend. Children make their own scarecrow for a donation fee and the school then publicise the event on Facebook, in local shops, etc with a donation given by participants. Use the school car park for a car boot sale, selling the pitches in advance and charging a small entrance fee for the shoppers. Set up an outdoor screen in the school car park and sell tickets in advance for car parking spaces. Have popcorn and drinks for sale too. 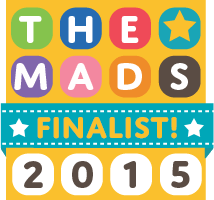 50p to enter, Poundland hamper of creative stuff to win. Once a year the children all make things from recycled items and parents are invited to their eco afternoon to purchase what they’ve made. Usually between £1 and £2 an item. Print off your own bingo sheets to play. Everyone brings a duvet and a board game. Set up some buckets, sponges and polishing cloths (all from a pound store) and clean cars in the school car park. Get the kids to make some flyers to advertise locally. 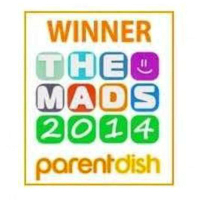 Gather the family or just teams of children for a quiz night. Small entry fee and a prize for the winning team or their names on a regular leaderboard displayed in the school. Bring slippers, duvets and watch a movie in the school hall for a small fee. Chippy chips or Mcdonalds – get the kids to vote. Where the kids come along ready for bed and listen to stories read by the teachers. A film, chocolate selection box or popcorn and hot chocolate. HOW ABOUT THEMED DAYS OF THE WEEK? Bags of mix-ups from the sweet shop. Crepes for sale after school on the yard with the help of a super duper day pancake maker. Hot chocolate sold after school on the yard. Chocolate crispy cakes for sale after school on a Thursday. Ice lollies for sale on the yard on a Friday. A selection of pound store items for sale, pocket money toys, pens, pencils, playing cards, dominoes, etc. 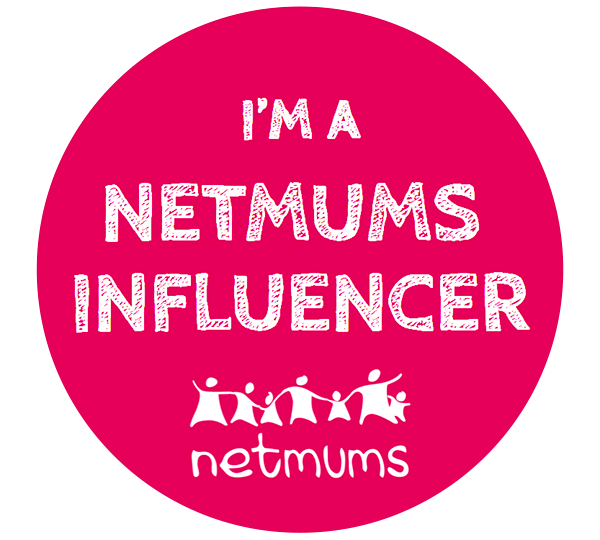 Fill a paddling pool with water and ducks then use a net to fish them out. Ducks with an x marked on the underneath win a prize. Parents donate good quality preloved teddies and toys. Each toy gets given a name and you pay £1, pick a name from the hat and take that toy home. Donations from parents of tins, bottles, etc. Attach a raffle ticket on each item and the corresponding ticket in a box to be picked out. Suggested prizes could be signed boxing gloves, a football party, holiday camp days, children’s books box sets, tennis lessons. Set up a permanent book sale point in the school where children can buy books for a really small fee. The fee can be reduced if a book is exchanged for another. Children are given paper bags to decorate and fill with items and then sold. Spray paint gravel gold and then drop into a troth of water and sand. Children then use a sieve to find it. 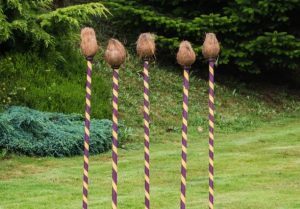 Who doesn’t love a coconut shy? Ask a local farm to bring donkeys to the school field to charge for rides. Always a winner! A packet of digestive biscuits, icing and some sprinkles. 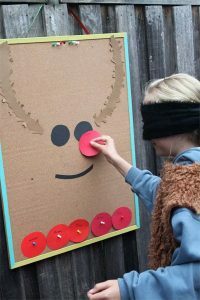 Fill a box with shredded paper and fill with 2o carrots (snowman noses). Paint some of them gold and those who pick out a golden carrot win a prize. Fill a paddling pool with water and Christmas baubles. Then fish out the baubles with a net. Each bauble has a different coloured spot, each colour representing a prize. 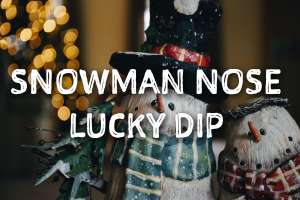 Check out our family Magical Christmas Traditions and Fun! Wrap a large cardboard box in festive paper and put several holes in the side. 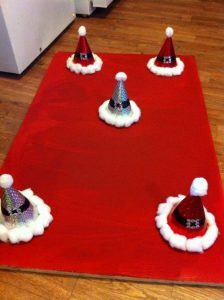 Poke different lengths of tinsel into the holes. The players that pull the long ones out win a prize. 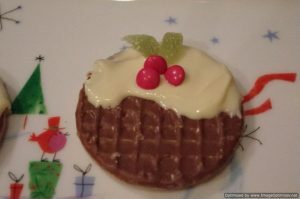 Chocolate digestive biscuits, some white icing and small sweets for decorations. Use an inflatable globe and get the children to mark on it where Santa is delivering his presents. At the end, the one who marked the closest wins a prize. 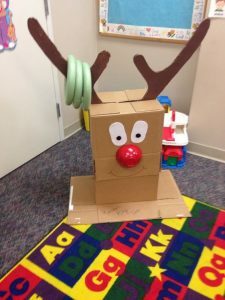 Make a Rudolph the red-nosed reindeer from cardboard and kids try and throw rings over the antlers. Stick party hats to a mat and kids try and get hoops over the hats. 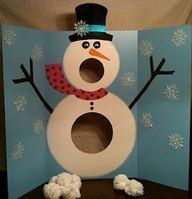 Paint or draw a large snowman on cardboard and kids have to throw balls into the holes on the tummy and for the mouth. 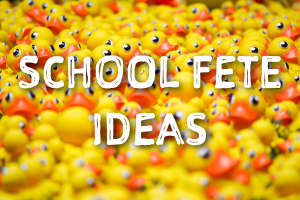 You could you ping pong balls or get the kids to make pom poms in class that day. 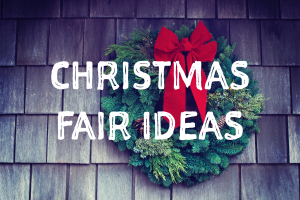 We asked our Family Days community for their ideas for cheap stocking fillers and they came up with a fabulous list of inexpensive and fun ideas which would be ideal for a sibling presents stall. See 70 Fabulous Stocking Filler Ideas. And that’s it. We hope our ideas are useful and would love to hear if you have any more ideas to add to the list. 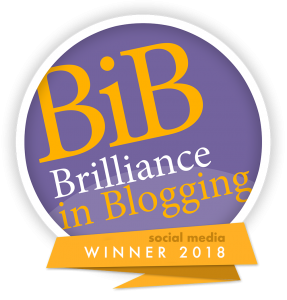 for all the fabulous ideas!